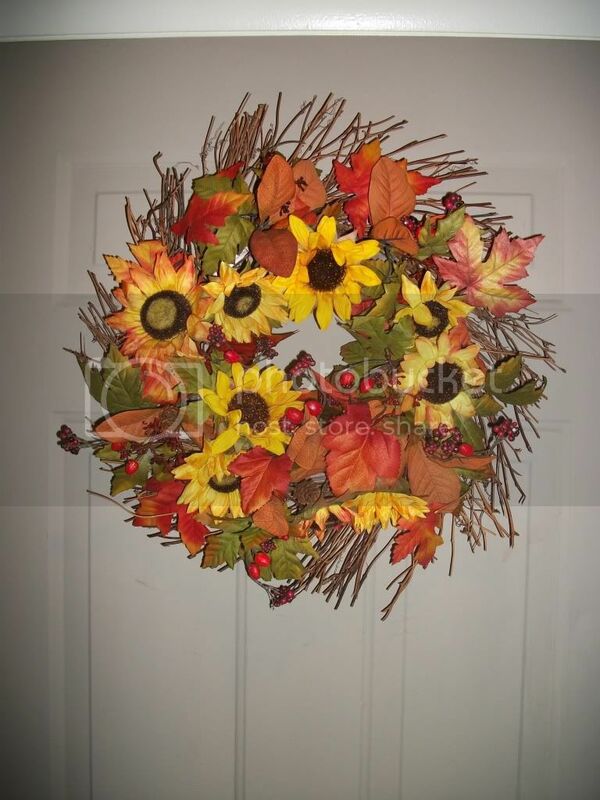 Fall is my favorite season and I love to decorate for fall. 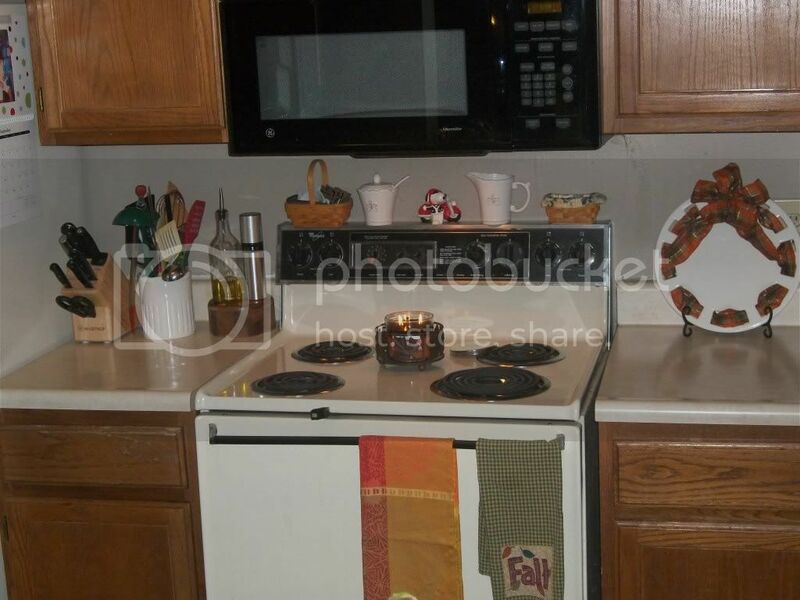 I love the warm oranges, and reds and browns, and the colors just go so well with my decorating style. 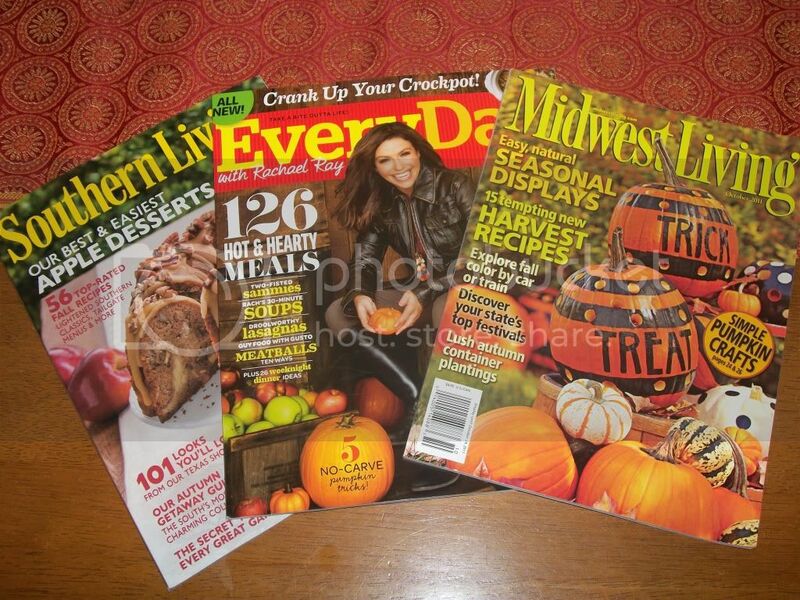 All of these fall magazines have given me some inspiration to get ready and excited about fall. I will admit I am not excited about colder weather and winter soon approaching, but I am enjoying the cooler, crisp temperatures. I am also getting excited about pumpkin flavorited items and I actually hit up Starbucks yesterday for my first pumpkin spice latte of the season (which you can also find a knock-off version, or 2, here). I have to tell you a quick story about my Starbucks trip. I placed my order and then pulled up to the window. The girl working the drive through was very perky and when she repeated my order she then said "you look super excited about this pumpkin spice latte." I was excited, but I don't think I looked overly-excited. She then asked if this was my first of the season, and when I said yes, she said she was so excited to be experiencing my first of the season pumpkin spice latte with me. She then handed me my drink and told me that she hoped that this latte was everything I expected and more. She was very sweet, but it just made me laugh because I think she was more excited about it than I was, and I was pretty darn excited. Anyway...I do have some other pumpkin flavored treats, which you can find here. I also am eager to find some new recipes to try and share as well. Last year I totally stocked up on canned pumpkin so it would get me through the season and through winter. I am sure that I will stock up this year as well...ha! So here are some of the fall items I have put out for fall. I have some halloween decorations as well, but I'll hold off until October before I pull them out (don't want to rush the seasons too much right!). The wreath on my front door. My front door is not very protected, so I keep my wreaths on the inside of the door. I wish I could find something that would outlast the weather, but for now, to keep my wreaths looking nice, I keep them indoors. This is the center piece on my coffee table in the living room. I got this idea from a Crate and Barrel mailer last fall. 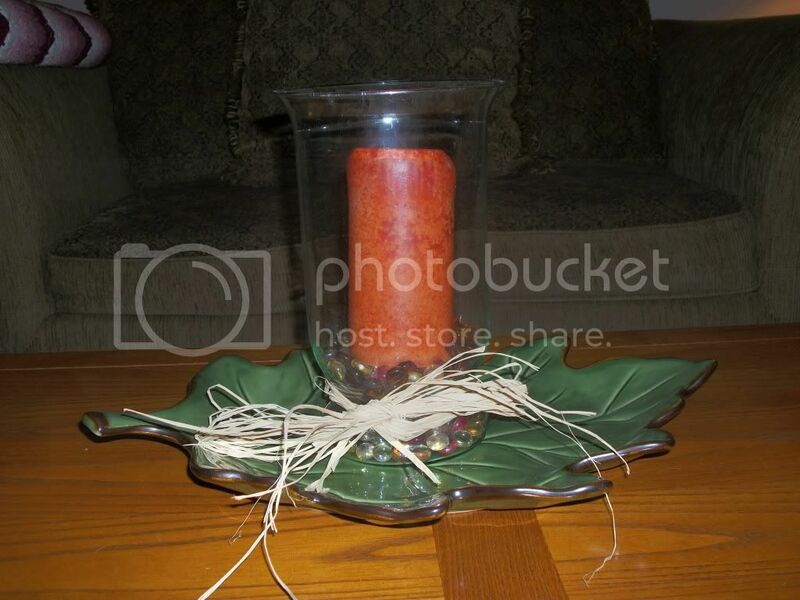 I just used my "traveling leaf" (as my friends call it) platter, placed a hurricane with some fall shaped glass beads (Pier 1 last year) and a pumpkin spice candle, and then tied some raffia around it. I have had the candle for a few years now, and it still smells so good, even unlit. Go Pier 1 candles! This is my dining room. I got the topiary at Garden Ridge a long time ago. I am sure you can find something similar at Joann's, Old Time Pottery or Garden Ridge. The table runner I got last year at Pier 1. I need to find some fall inspired candles for my candle holders. They just look too springy in this picture. Some fall things for the kitchen. Dishtowels (orange one from Crate and Barrel, plaid one from Kohls), some plaid ribbon for my platter (Southern Living at Home), and of course a cinnamin pumpkin candle from Bath and Body Works (my favorite!). A few weeks ago while visiting my Grandparents in W.Va. we went to Blenko Glass and I got this orange glass bowl. 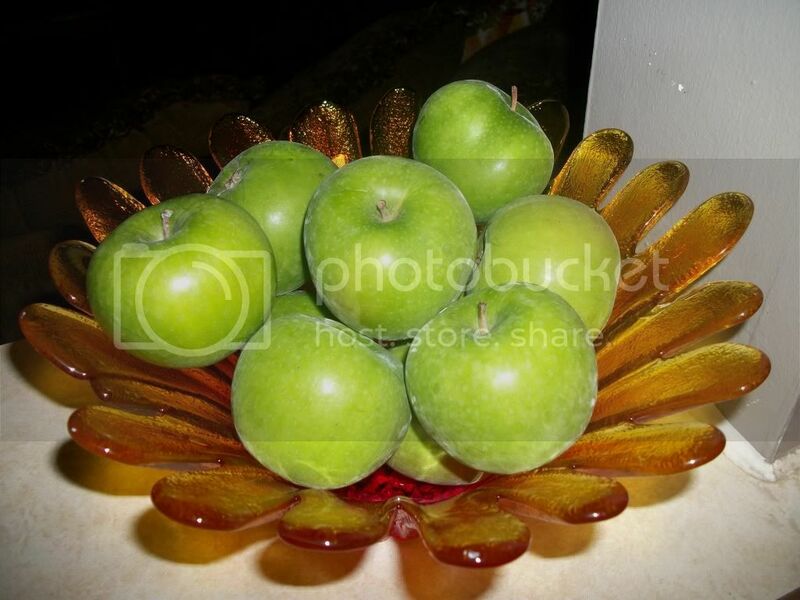 I thought it looked like a flower and thought it would be perfect to hold some delish fall apples. 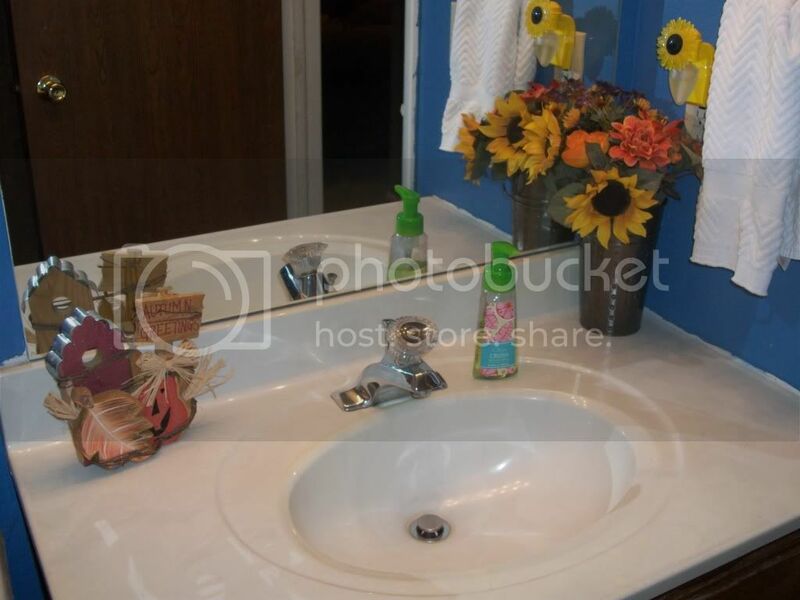 Of course the bathroom can't be left out. I got this little fall sign a long time ago at Hobby Lobby for probably only a few dollars. I didn't really have a place to put it, but it fit perfectly on the sink in my guest bath. The sunflowers are there all year long, but they are very fall-like. Hope you enjoyed my fall decorations. 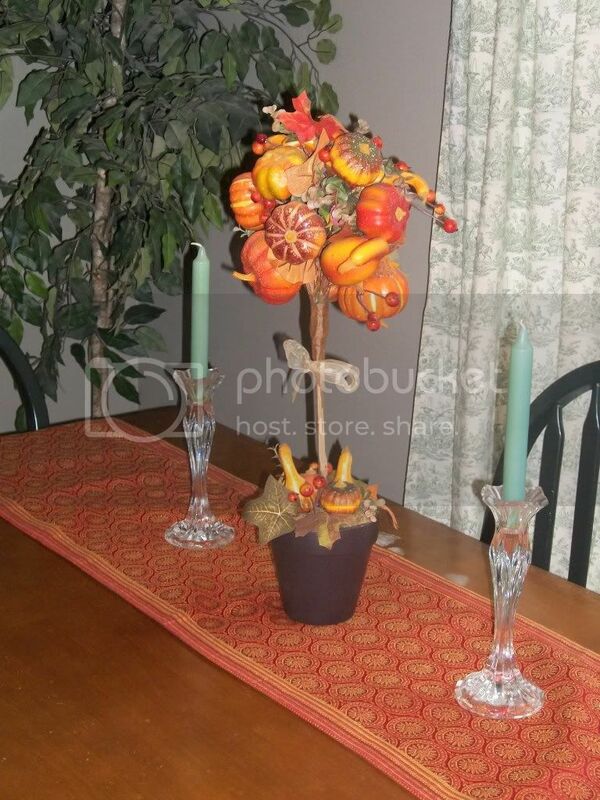 If you have any fall inspired decorating ideas or recipes, please share. I love your fall decorations, and that's too funny about the latte! I had my first pumpkin ale of the season last weekend, and it was tasty!